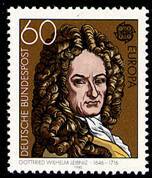 Gottfried Wilhelm von Leibniz (sometimes spelled as Leibnitz) was born on July 1, 1646 in Leipzig. He was a son of Friedrich Leibniz, a professor in moral philosophy at the University of Leipzig. Shortly before his death Friedrich is reported to have pointed towards his library and instructed his 6-year old son "Take, read." This gave the young Leibniz unlimited access to his father's large library and laid the foundation for him to ultimately become one of the great philosophers, scientists, mathematicians of the 17th century. At the young age of 15 he enrolled at the University of Leipzig to study Law, but when at the age of 20 he applied to be awarded his doctorate, it was refused as he was considered too young. He left Leipzig and went to the University of Altdorf in Nürnberg, which quickly recognised his genius, awarded him his degree and offered him a professorship, of which he accepted the first but turned down the latter. In 1667 he accepted a position as advisor to the Elector of Mainz. This function enabled him to travel extensively across Europe and he regularly visited cities like Paris and London. During his travels he met many scientists and scholars of his time, incl. Huygens, Boyle, Armauld, Spinoza, etc. He stayed in contact with most of these scientists and philosophers to exchange ideas and to discuss developments, theories, religion and politics. 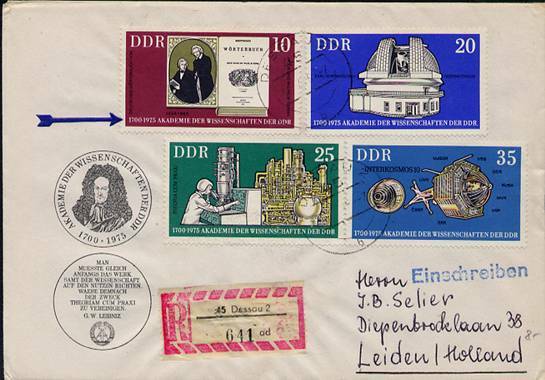 This resulted in an extensive correspondence and more than 15,000 letters from Leibniz to about 1000 different people have been preserved. In 1672 the Elector sent Leibniz to Paris on a diplomatic mission to King Louis XIV. He would stay in Paris till the Elector's death in 1676. It is during his stay in Paris that he learned of Pascal's calculator. Having noticed the Pascaline's limitations, Leibniz was convinced he could design a better machine and started to work on a device that not only could add and subtract but was also capable of doing multiplications, divisions and even evaluating square roots of numbers. He soon faced the same obstacles that Pascal had experienced – poor workmanship, unable to create the fine mechanics required for the machine. Leibniz solved this problem by engaging the services of local clockmaker Olivier who was a fine craftsman. The Leibniz calculator, which he called the Stepped Reckoner, was based on a new mechanical feature, the stepped drum or Leibniz Wheel. It was a cylinder with nine bar-shaped teeth of different lengths, which increased in equal steps around the drum. This brilliant concept has been used in many later calculators, for example the famous barrel-shaped Curta calculator. When the first wooden prototype of the Stepped Reckoner was constructed Leibniz was able to show it to the Royal Society in London. Although the model did not work properly, the Society members were impressed and asked him to create a proper working model. The final version was only completed in 1674. Although it is believed only two Stepped Reckoners have been constructed, the machine itself was actually lost for more than 200 years. Apparently it was stored in an attic of one of the buildings of the University of Göttingen where a crew of workmen who came to fix a leaking roof accidentally found it in 1879. This model resides in the Hannover State Library. The other model is in the Deutches Museum in München. In the 20th century a number of replicas of the Leibniz calculator have been built, one of them by IBM. 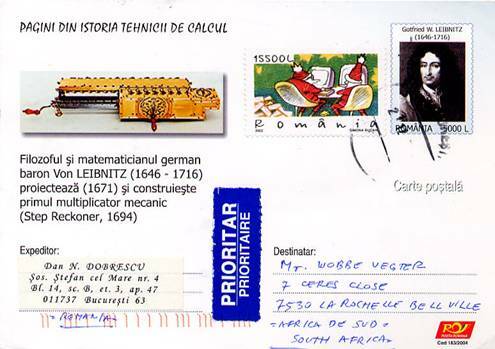 Although quite a few stamps have been issued to commemorate this great scientist, only one philatelic item, a Romanian Postal Card issued in 2004, pictures the Stepped Reckoner. Leibniz is more widely known for his work in mathematics. Following his meetings with Huygens in Paris he started studying geometry and in 1674 he invented differential and integral calculus and designed a mathematical notation for it. In the later years of his life he landed up in arguments with Isaac Newton, who was president of the Royal Society in London, who claimed he had discovered it first. The mathematical community was divided on who was first, but the Germans still claim it to be Leibniz. However, as Leibniz' notation was better than Newton's, we still use the Leibniz notation today, like his integral symbol ∫ which is an elongated S from the Latin word summa. The second area where Leibniz had a significant influence on the development of the future computer was the discipline of symbolic logic. He believed that the laws of thought or human reasoning, i.e. logic, could be described in a mathematical system and language, rather than the normal spoken and written language which he found too ambiguous in its description for that purpose. According to Leibniz' logic, man's ideas are compounded of a small number of simple ideas which form the alphabet of human thought. Complex ideas derive from these simple ideas by combining them in a way analogous to arithmetical multiplication, hence the logical operators addition, negation and multiplication. His ideas were largely ignored by the scientific world at that time as they barely understood his concepts. This was partially caused by the fact that his developments in this area were not published as such but "hidden" in his correspondence. It would be George Boole who used Leibniz' ideas to develop his Boolean logic about 125 years later. When Leibniz came upon the Chinese "I Ching" (Book of Changes") he found his ideas confirmed as I Ching depicts the universe as a series of on-off, yes-no, male-female, dark-light dualities. From this Leibniz developed his binary system, consisting of ones and zeros. In his beliefs the binary system had a semi-religious – philosophical meaning with one representing God and zero being Void. When converting the decimal numbers to a string of ones and zeros, the long strings of binary numbers must have disheartened him as he never combined the concept of his binary system with his mechanical calculator. It would be Atanasoff in the late 1930s who would achieve that. Leibniz had never really found a use for his binary system. What is a binary system? Larger numbers quickly result in very large strings of 0s and 1s, for example 2345 becomes 100100101001 in binary. Computer scientists in the 20th century managed to harness these growing strings of binary numbers and they would introduce the term bit (from binary digit) for storing each 0 or 1, but that was more than 200 years after Leibniz' death. With his many contacts all over Europe it is not surprising that Leibniz tried to bring some of these scientists in contact with each other. This finally resulted in his founding of the Berlin Academy of Science in 1700 where he also served as its first president. The last years of his life Leibniz lived in rather obscurity and when he died on November 14, 1716, in Hannover, his passing was not even acknowledged in his Academy of Science, nor in the Royal Society of London.